Courtesy of KELLER WILLIAMS AT THE LAKES. Come live and play in Celebration! Less than 4 miles and approximately 7 minutes to Walt Disney World! Easy access to all attractions east, west, north and south! 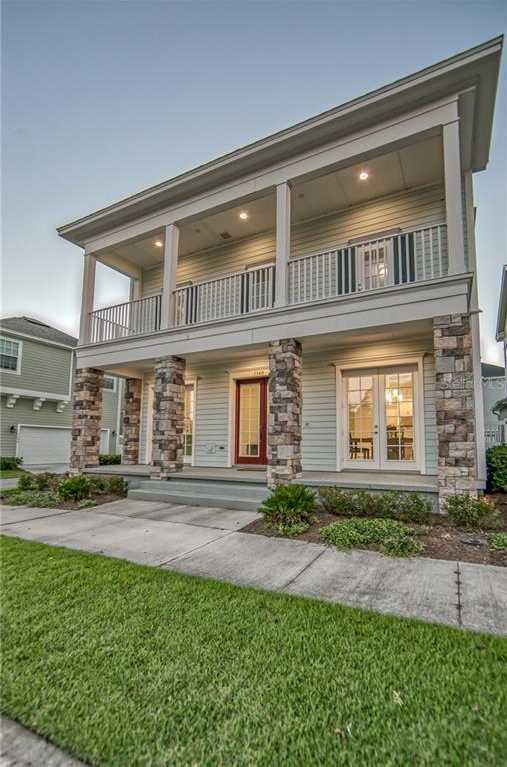 This custom built Anastasia Model by award winning David Weekly Homes is located in Spring Lake Village on a corner lot with panoramic water views. Your new address, 1340 Cap Rock, features first and second level spanning balconies! First level living is your open floor plan with a Gourmet Kitchen, dining room, office/den and living room with a first floor bedroom and full bath! Upstairs you will enjoy a master bedroom suite with a magnificent master bath plus 2 spacious bedrooms, 2 full bathrooms and a spacious loft with room for a wet bar! Private Laundry is located upstairs. Step outside to enjoy your fenced in professionally paved side yard with a water view! This home is nearly brand new and hardly lived in, featuring hurricane windows and a builders warranty. As a resident of Celebration you will enjoy the community parks and pools along with miles of jogging and biking trails leading to downtown restaurants, businesses and shops. Celebration features a Championship Golf Course, spectacular community events year round, outdoor movies, dog park and much more! The HOA at Spring Lake takes care of all your lawn maintenance. Restrictions: Verify pet restrictions with HOA. Please, send me more information on this property: MLS# S5008345 – $789,900 – 1340 Cap Rock Dr, Celebration, FL 34747. I would like to schedule a showing appointment for this property: MLS# S5008345 – $789,900 – 1340 Cap Rock Dr, Celebration, FL 34747.